Experience this tropical island’s enchanting blend of native Chamorro, Spanish and American influences, with stunning beaches, great shopping and breathtaking views. Guam is Micronesia’s largest island, part of the Mariana Islands archipelago. 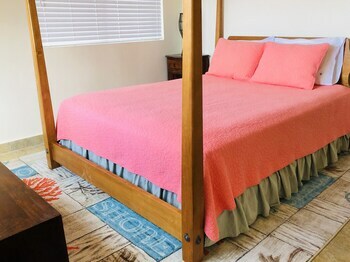 This North Pacific Ocean land is an unincorporated territory of the United States, known for its stunning coastline, picturesque harbor, enthralling native culture and American flair. 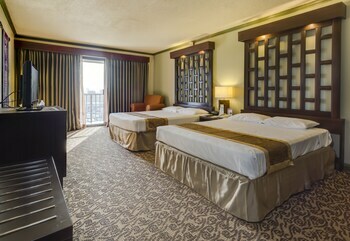 Come to Guam for a serene getaway, romantic escape or family-style vacation. Visit beaches to relax under the warm tropical sun or try exciting watersports. Discover the local Chamorro culture and learn about Guam’s fascinating World War II heritage. 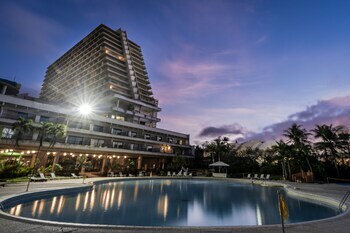 Start your Guam trip in Hagåtña (Agana), the island’s metropolitan capital. Explore the village via a historic walking path and find relics from Guam’s European influence, such as Plaza de España and Dulce Nombre de Maria Cathedral-Basilica. 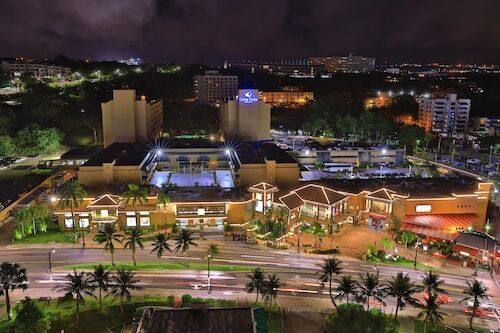 Visit the Chamorro Village shopping destination and its enchanting Wednesday Night Market. Try delicious Spanish-influenced local fare and watch the market’s brilliant street performers. See traditional fire dancing and purchase handcrafted souvenirs, such as shell necklaces and woven baskets. Explore nearby Tumon to find upscale hotels, boutique shopping and a waterfront strip of bars and clubs. Head north to find Guam’s scenic limestone plateau and a collection of beautiful beaches. Stop by the charming village of Dededo to browse the stalls of a busy weekend flea market. At Two Lovers Point, a breathtaking lookout at the northern tip of Tumon Bay, enjoy stunning views of the east and west coasts of the island and learn about the Chamorro legend that gave the lookout its name. Visit the Guam National Wildlife Refuge on Ritidian Point to spot green sea turtles below soaring limestone cliffs. In Guam’s southern region, discover a mountainous landscape and farming communities set on green hillsides. Learn about Chamorro traditions at Inarajan's Gef Pa'go Cultural Village, where you can watch craftsmen making regional handicrafts from inside an authentic Chamorro thatched hut. Explore the southwest coast and visit beautiful Cocos Island, black-sand Talofofo Bay and Cetti Bay. Hike to the magnificent Upper and Lower Sigua Falls. Reach Guam by plane via Won Pat Guam International Airport. Explore the island by bus, charter boat or rented car. 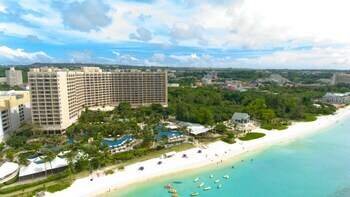 Visit Guam between December and June for the island’s dry season. 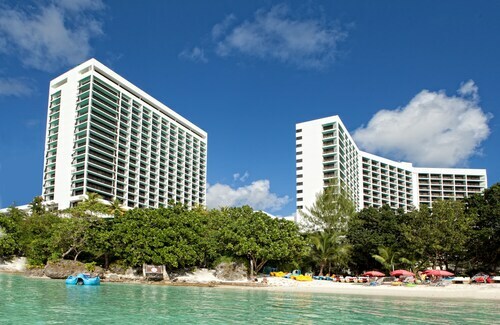 The Hyatt Regency Guam is situated on 150 meters of white-sand beach along the clear, warm waters of Tumon Bay. 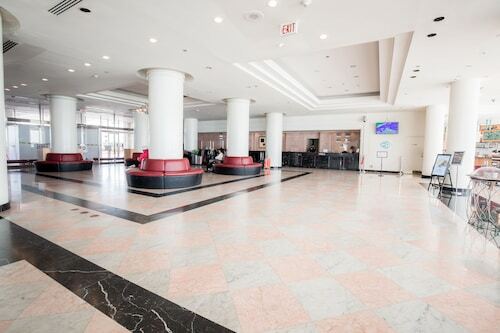 The DFS Galleria and Tumon Sands Plaza shopping centers are 0.2 miles away. 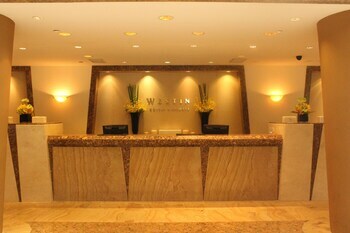 Located in Tumon, this beachfront resort is in the city center, just steps from UnderWater World and The Plaza. 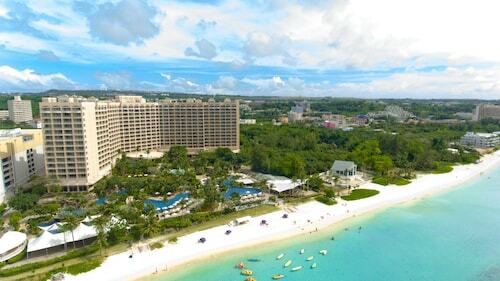 SandCastle and Slingshot Guam are also within 5 minutes. Located along the clear blue waters of Tumon Bay, this resort is 1.5 miles from duty-free shopping at Tumon Sands Plaza and DFS Galleria. 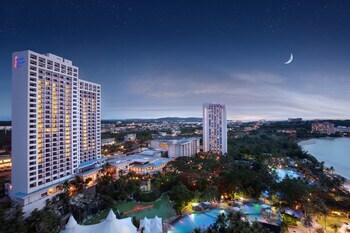 Two Lovers Point and Micronesia Mall are 2.5 miles away. Haneda - A.B. Won Pat Intl. TYO-All Airports - A.B. Won Pat Intl. Kansai Intl. - A.B. Won Pat Intl.